Overcoming Movement Disorder: Breaking News! 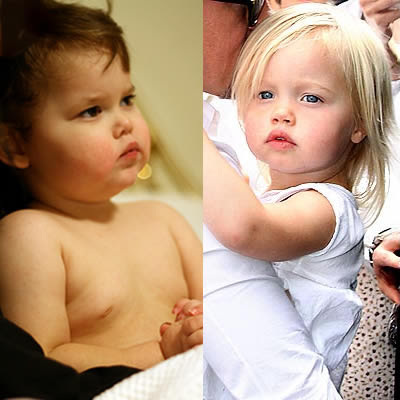 Perez Hilton is reporting that Bertrand T. Might and Shiloh Jolie-Pitt have ended their year-long romance. The stunning break-up of "Shitrand" brings a discouraging end to the U.N.'s secretive "Beautiful People Breeding Program" (BP2) in only its second generation of trials. Representatives for both parties have declined comment, citing the painful split and a need for privacy. Shitrand?!?!?!? OMG, you are such a riot! Ahahahaha! I know that is hilarious, way too funny! Me encanta tu sebtido del humor! Estas brutal! Los dos son dos preciosas estralleas. Que pena que se dejaron! Both parties were rumoured to have already found comfort in the arms of others (namely, their parents). Just as long as he doesn't go off diet in the ensuing round of wild, post-breakup partying :). Too bad! They made such a cute couple with their matching pouts! Even better than saying Shitrand is thinking up Shitrand in the first place. And I love that you chose a shirtless pic for B. Those are undeniably two beautiful kids! Wow!